James F. Fagan was born in Louisville, Kentucky and his family moved to Little Rock, Arkansas in 1838. Fagan fought with the Arkansas Mounted Volunteers unit during the Mexican War and achieved the rank of lieutenant. Fagan spent some time as a politician, serving in the Arkansas House of Representatives from 1852-1853 and as a Senator from 1860-1862. After Arkansas seceded, Fagan raised the 1st Arkansas Infantry Regiment and was named its Colonel. This regiment fought at the First Battle of Bull Run on July 21, 1861. Fagan led this regiment when it fought at the Battle of Shiloh on April 6-7, 1862. The regiment suffered a 45 percent casualty rate. After Shiloh, Fagan was promoted to Brigadier General on September 12, 1862. On July 4, 1863, He commanded an infantry brigade under Lieutenant General Theophilus H. Holmes during the Battle of Helena. 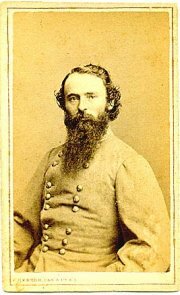 April 25, 1864, Fagan commanded the Confederate forces during the Battle of Marks' Mills. This was a decisive victory, and he was promoted to Major General on April 25, 1864. Fagan was 36 years old when he commanded one of the cavalry divisions during Price's Missouri Expedition in 1864. His division consisted of mostly Arkansas Cavalry. There were four brigades and two batteries of two guns each. After the raid into Missouri, Fagan ended up as the commander of the District of Arkansas in the Confederate Trans-Mississippi Department. He served in the C.S.A until April 1865. President Ulysses S. Grant appointed Fagan to be a United States Marshall and he served from 1875 - 1877. Fagan died in Little Rock, Arkansas and is buried in Mount Holly Cemetery there.